This photo on the left is a piece of network marketing history.I took it while hanging out with Mike Dillard at the Magnetic Sponsoring headquarters last November. It is a photo of a physical copy of the ORIGINAL Magnetic Sponsoring manual that Mike Dillard wrote to support his network marketing team before making it available to the public. Yes, at that time he was still waiting tables at P.F. Chang in downtown Austin. Oh, by the way, if you have not heard of Mike Dillard (you’ve probably been under asleep under a rock 😉 )… he went from waiting tables to building a MASSIVE 8-figure info-marketing and direct-sales business within 18 months. It’s hard to see this from the photo, but the report was printed with a cheap ink-jet printer with some smudges on the cover and held together with low-quality comb binding. You see, Mike made do whatever he was able to string together at the time to move forward. He took baby steps along the way… getting rejected over and over again, studying copywriting, attending seminars, etc. Are you taking baby steps to move forward in your business? I certainly hope you are… because that’s really the *only* way. 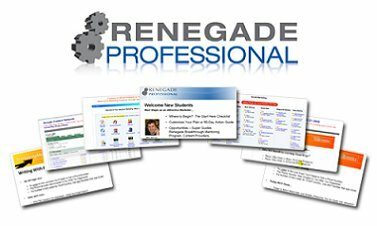 This ebook contest I’m holding with Renegade Professional is free for all of their upgraded members. The winner gets my professional graphic designer to do create the graphics for his/her newly published ebook! And cudos to Cindy Murphy for taking massive action right after the live event in Portland less than 45 days ago! Her first ebook is almost complete. Oh.. and good luck to the contestants!